"Though the mountains be shaken and the hills be removed, yet my unfailing love for you will not be shaken nor my covenant of peace be removed, says the LORD, who has compassion on you." but the Rock holds me! One of my favorite subjects to paint is rocks. Rocks come in an infinite variety of sizes and shapes and textures. Painting the crevices and pits in them (especially when they are near water and have water washing over them) is fascinating subject matter. 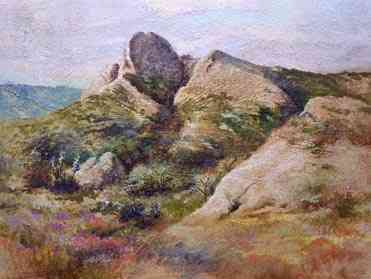 Painting the shapes of shadows that creep across the ground next to boulders or pebbles is challenging. Rocks have been used as places to hide. In the rose red city of ancient Petra the Edomites carved buildings right into the surface of the rocky cliffs. The only entrance into Petra is a narrow passage with high walls on either side which leads into the city. The inhabitants believed that they were safe from all attacks. God had other thoughts. He told them through His prophet that He Himself would punish them for the evil they had done to His children -- the Israelites. The Edomites and Israelites were related since they had a common ancestor -- Isaac. They were descendants of Jacob's twin brother, Esau. But Edom hated Israel and attacked them. Another group of people believed they were safe in their almost perfect rock fortress formed by natural rock and towering over the valley below -- Masada. It was there that first century Jews held their last stand against the Romans. However, their almost unassailable fortress failed them in their time of need. These rocky fortresses remind me of the only secure fortress -- Almighty God. He has promised to be a fortress for His people. He has called Himself a rock, a place of safety for His loved ones. How blessed to hide in the Rock of Ages -- our mighty fortress -- the Lord Jesus Christ. So hide in God as your rock fortress and also trust Him to make you what He wants you to be, so that His work may not be spoiled. That would be to your great loss! Trust and yield to Him now. And then rejoice forever! No matter what life brings. to those who have been brought low. Your grace is still around . . . Some rocks are very valuable since they are gemstones. They can be cut up and polished to make exquisite jewelry. One of my husband’s favorite hobbies used to be rock hunting. He enjoyed looking for rocks in out-of-the-way places and then bringing them home. Then he sliced them and polished and wrapped lovely stones artistically with sterling silver or gold wire. The final outcome was a collection of gorgeous gemstone gifts that he gave to me and other loved ones. God's Word is more valuable than the most costly gem. It is better to hunt through God's Word uncovering precious truths than to go in search of earthly gems. Rocks come in a variety of colors and have differing value. Diamonds, of course, are extremely valuable rocks. I especially admire opals with their fiery flashes of color locked just underneath the surface of rough stones, but when polished carefully, they shoot out brilliant shimmers of red, green, blue and other rainbow hues. God is refining His children just like an opal worker. He buffs each child carefully through assorted trials, but he doesn’t do more than He knows He will enable them to bear. Opals are fragile. If they are buffed too much, their fiery splendor can be lost. “There hath no temptation taken you but such as is common to man: but God is faithful, who will not suffer you to be tempted above that ye are able; but will with the temptation also make a way to escape, that ye may be able to bear it“ (1Corinthians 10:13). What happens to gems in the raw to get them to the point where they can be displayed as beautiful jewelry is a lesson to us for Christians. There is painful cutting and polishing involved to get the final product. If the gem could talk, it might cry out and beg that the cutting, grinding and polishing be stopped. But God as the Master Gem Maker is intent on the finished product. He wants to display us as gems in the eternal ages to come. If He stops the grinding and polishing process which is so painful to us, too soon -- His work will be spoiled. The gem will not be ready to reflect the flashes of His glory. The purpose of our little lifetimes in this world is not to be comfortable, nor happy, but to have Christ formed in us through the power of the Holy Spirit. The time of comfort and glory is not now. It will come soon enough. And at that time there will be no more pain or suffering. God’s gems that yield to the Master Jeweler's work will shine as the stars forever and ever!